Distinguished Service Award: The purpose of the PGCA Distinguished Service Award Pin program is to adopt a way to recognize a member's personal contributions of spirit, time, dedication and reliability unselfishly donated for the good of the organization. These members will be recognized before their peers at an official PGCA function, primarily the PGCA Annual Meeting and Banquet. The members recognized will have gone 'above and beyond ' the ordinary and will have distanced themselves by the merit of their deeds. They will have furthered the mission of the PGCA and will have promoted good will and fellowship among members and visitors at activities including the Forum, PGCA sanctioned events, PGCA displays, and PGCA 'headquarters' at shows and events. They will have given freely of their time in doing these deeds and will have presented a friendly face of the PGCA. The award for each recipient will be a lapel pin replicating the distinct outline and engraving of the fore end tip of a high grade Parker gun. The recipient will also receive an award letter that is suitable for framing. Members of the PGCA who have received the Distinguished Service Award Pin have their names placed on an Distinguished Service Honor Roll to provide a permanent record of their extraordinary service to the Parker Gun Collectors Association. If you would like to nominate a fellow PGCA member to be considered for the Distinguished Service Award fill out a nomination form and submit it to the PGCA. Nominations are accumulated for a rolling three-year period. After a name has been in the nominations file for three consecutive years it will drop off leaving only current (within a calendar three years) entries for that nominee. Parker Pages Contributors Award: A pin will be given to all contributors to Par ker Pages, as a recognition for that person's efforts in providing articles, photographs or information used in Parker Pages. When you see someone wearing this pin please extend your thanks for supporting the quality of material we try to present in every issue. 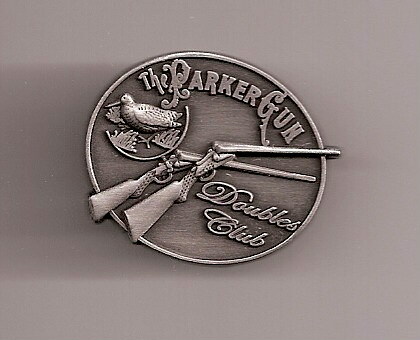 “The Doubles Club” Award: Your Parker Gun Collectors Association Board of Directors has approved a brand new program entitled “The Doubles Club”. A special pin has been created utilizing the old style Parker Bros. letterhead featuring two Parkers, one hammer gun and one hammerless, with the familiar woodcock. The pin is silver and a handsome addition to your hunting cap, vest, or gun club attire. A facsimile is affixed for you. *You must be a member of the PGCA in good standing. * You must have shot “A Double” with a Parker Gun. * The definition of “A Double” is: both birds must be in the air at the same time. That eliminates the often probability of a bird rising after the first bird is dispatched and you then score on the second riser with the second barrel. Mary will, in turn, send you this special pin and a letter acknowledging accomplishment of this feat and your name will appear on the Doubles Club Roster. Pins are not limited to only one double shot but our Chairman will be suspicious of any hats ringed with doubles pins. I assured him that our fine and honorable members are of the highest order and would only have to live with themselves should any imagination be linked to such “dead eye” shots.